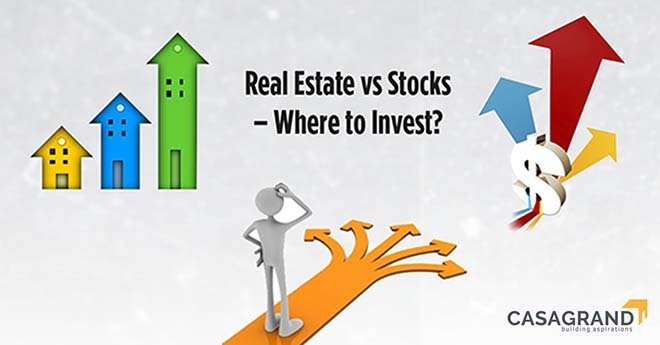 Real Estate Vs Stocks – Where To Invest? When looking for investment avenues, the first few options that come to most people’s minds are either real estate, gold or stocks. However, making the right investment decision involves comparing how each of these avenues fare against each other. We did a comparison of real estate vs gold in this space some time back and now we have a detailed comparison of real estate vs stocks which is aimed to help you choose the best option that suits you. One of the biggest advantages of Real Estate is the constant cash flow it provides on a monthly basis. When renting a house you can expect a constant cash income over a long period of time. Stocks however do not assure income on a constant basis but for some periodical returns by way of dividends, rights issues and bonus shares. Over the past few years, Real Estate has seen a steady growth providing returns of about 20% especially after the price re-ratings that occurred between 2003 and 2008. The stock market is highly prone to fluctuations. Unless you are very adept at identifying high quality stocks there is no pre-existing pattern that can help you find out if a particular stock will give you good returns or not. The chances of being deceived in real estate is less provided you have done your homework because you can physically inspect your property, run a background check etc. In stocks the risks of being cheated is higher if you do not have enough knowledge about how the market works. Most investors have often spoken about emotional satisfaction they get when buying a property. Aspects such as security, social reckoning and pride of owning a property makes real estate investment an attractive proposition. More often than not people do not get the same level of emotional satisfaction when investing in stocks. The risk involved in real estate investment is relatively low in the long term. You can always avoid the worst case scenario by selling your property at the earliest and get out of the deal. Stocks on the other hand involve a great deal of risk. Initially, it is important to check if the particular stocks purchased are worth the investment. Once a particular stock maximizes returns investors often are lured to invest more on the same scripts. This can sometime backfire and there have been several cases where people have lost a lot of money. Leveraging with available funds is possible much better in Real Estate because of a favourable ratio of margin money to total cost. In simple terms, with a small margin money of 20% of the property value, you can purchase an expensive property with the help of bank loans. On the other hand the concept of margin money in stocks is still unfavorable in comparison to real estate. Though one can trade stocks on margin money, one cannot invest in stocks for the long-term with margin money. Stocks, on the other hand, are virtual and you cannot see anything material immediately after the money is invested. Initial investment in Real Estate is in most cases a minimum 20% of the value of the property. When buying a 2-BHK flat worth 40-50 lakhs a minimum margin money of around 8 lakhs is still needed. The initial investment required in stocks is very low sometimes even a few thousands. Real Estate investment is restricted to only two broad categories i.e. residential or commercial. Stocks however, have a very diverse range of avenues to invest. With stocks you can invest in a variety of industries and ensure that your investment is protected even if one industry does not perform well. In real estate converting your property to liquid cash is a difficult procedure as it is time consuming and dependent on how quickly you find a customer to purchase your property. Most stocks on the other hand are very liquid, with the money being credited to your account within three working days. Rented apartments have to be maintained on a monthly basis and you might have to spend a fair amount of money on overheads, which to an extent reduces your monthly net return from the property. When investing in stocks overheads and recurring expenses are almost non-existent. Whether a real estate property is sold within or after 3 years, there is the element of Capital gains tax. In case of stocks capital gains tax is applicable only when sold within the first year after which the returns are exempt of capital gains tax. In general, when it comes to a stable investment for the middle class, real estate does seem the more obvious choice but as far as diversity and categories is concerned stocks seem better. A good alternative to stocks can be REITs which work on similar lines. On the whole, it is your financial situation and level of comfort that should be your base priority as far as decision making is concerned.